Archaeological remains give us superlative insights into various aspects of the architecture of Pompeii and indeed the architecture of ancient Rome: Pompeii’s urban development through time, the architecture of houses, commercial and public buildings, roads and sewers. The techniques and materials used coupled with the decorative systems employed are all there frozen in time. Other than the temple to Apollo and some other piecemeal elements, the earliest extant remains of ancient Pompeii’s architecture date back to around the 4th and 3rd century, for example in “the House of the Surgeon”, however a clear picture of Pompeii’s evolution only starts to emerge from the 2nd century BC: a number of surviving buildings date back to the last Samnitic period in the 2nd century during which a great deal of public building was undertaken as well as some large private residences displaying “first style decoration“, such as the House of the Faun or the House of Sallust. and the Basilica at the sw end of the forum, already mentioned above because it happens to be the oldest to be found in the Roman world (probably not so in Roman times, as there would likely have been others in the same region, not to mention the Basilica Porcia in Rome’s forum). A number of temples, probably the predecessors of those which stood at the time of the explosion. Decoration of important sites and residences would have been of the first style – mimicking marble blocks. The favoured buiding material was tufa block. The late Samnitic period was followed by a period as ally of Rome, rebellion and eventual conversion to Roman colony by Sulla. In the diagram below it is interesting to note how the building surge which followed the Sullan colonization was accretive and very much inspired by existing local custom. For ease of description I break down the development of Pompeii into 6 phases. Each of these was accretive and made use of what was already there rather than actually effecting any radical change. This produced interesting architectural results both in the buildings as well as the town planning because the city provided a progressive melting pot of cultural approaches and economic development. Stabian baths enlarged, an extra covered theatre built 70BC, second public bath near the Forum. Augustan period – around the year 0 – Strong Romanisation and great investment. Forum enlarged and improved by additions such as meat market, city offices. This period also saw the “Palaestra” exercise ground, a voting area (c/o the wool guild), remodeling of the theatre and an aqueduct with city-wide water distribution. Many of the luxury villas with 2nd and 3rd style paintings belong to this phase of the city’s life. Earthquake AD62 – followed by reconstruction, little innovation except for some votive sites. The only new large public work is for the building of the Central Baths, which were never completed. By this time the trading middle class was taking a stronger presence in city life and the upper class moving towards country villas. Some upper class sites are converted towards a more utilitarian purpose as the city has by this time seen economic downturn as well as the physical stress of the strong earthquake. Eruption AD79. The last 30 years were a period of economic downturn and progressive urban crisis. Only two of the large public buildings have been fully restored from the earthquake which had occurred 15 years earlier. The Forum is still under heavy construction work and the water distribution system still dysfunctional. First Samnitic period (sandstone and volcanic materials, opus quadratum and opus incertum) 4th-3rd C BC. Second Roman colonization period – Claudian and Flavian period (brickwork) 14AC-79AC. Pompeii happened to be in the mainstream of much of ancient Roman architectural innovation which seems to have been occurring in the Campania region around the 2nd and 1st century BC: roughly in correspondence with Pompeii’s annexation as Roman colony. 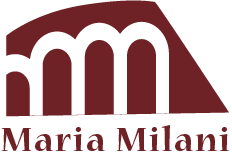 This activity was the result of the economic opportunity and changing social needs brought by Rome, combined with the technological and building skills readily available in Campania. Whilst Pompeii itself is unlikely to have been the hotbed of architectural innovation it is in many way fortunate that the city has enabled us to witness the architecture of a site which had for a period been situated in a region where architecture was at its most innovative. Pompeian houses also preceded those of Rome itself in architecture. Having set an idea of what is to be found at Pompeii in terms of Architecture it is now worth attempting to look backward at what factors enabled such a result to come about. A quick look at the history and timeline of Pompeii is useful to assisting such understanding: one of the fundamental factors influencing Pompeian architecture is the subsequent influences of different cultures, starting with the Samnites, followed by the Etruscans, Greek colonies and finally Romans. The various interventions on the city were always progressive in that they adopted what was there and adapted fresh concepts and technologies on top. The earlier Samnite-Etruscan city was the western part of Pompeii with the Forum, main temples and public buildings. A more organic approach to urban development is plainly visible. The rigorous grid structure of Greek cities, is most evident in the Eastern part of the city, near the amphitheatre with boulevard-like parallel streets (“decuriones”, W-E) connected by smaller cross streets (“cardines”, N-S) creating rectangular blocks of buildings (“insulae”). This is, on a smaller scale, similar to what would have been found at ancient Alexandria, except the latter was drawn from scratch whilst Pompeii saw continuous adaptation of what lay there before. Interestingly the eastern part of the city was still relatively underdeveloped at the time of the volcanic explosion, with large garden spaces still available – this probably explains that it is in this area that the amphitheatre was built. The presence of relatively open space yet to be fully developed would suggest that the population density had not reached the sort of critical levels which would have driven domestic housing upwards with apartment blocks such as are found in Ostia and Rome. Pompeii arose on a ledge of prehistoric lava flow 40m above sea level on the side of mount Vesuvius. This was subsequently covered by other deposits including volcanic cinders, pumice, stone and tufa which leveled out the spur. This ledge had a couple of flat areas but was otherwise dislevelled with a strong slope north-south towards the gulf. The lava flow stopped short creating a sharp cliff hence creating a strong dominating position over the sea. The only flat area is the extreme west corner of the city, where the forum is. The via dell’Abbondanza follows the most extreme slope, probably created by a channel of lava flow. The position was ideal in a number of ways and played a significant role in the city’s fortunes: It allowed control of the trading route between Stabiae and Naples as well as a dominating position with respect to the river Sarno, therefore enabling control of the access inland from the sea. Access to sea allowed long distance trade, particularly with north Africa and towards the Orient. Lastly the volcanic nature of the surrounding terrain made it extremely fertile and suited to growing agricultural produce, olives (oil) and wine. There is little evidence of the early settlement except for the temple of Apollo, a second temple by the “triangular forum” which at the time was probably out of the city walls. It occupied the south west corner of the city we now know and the streets largely follow the course of the ancient walls which enclosed approximately 10 Hectares. The population at the time was probably in the region of 2500 people. The layout is atypical in that it doesn’t match either Etruscan or Greek city types but rather local Italic in form, it developed around the forum, first to the North and then East around 475-425BC. Around the 5th century BC, economic prosperity coupled with its logistically good position required the city to be considerably expanded. The walls were extended north and east, making a perimeter of 3 km and 220m, to enclose the 66Hectares of area we now know, following the area permitted by the lava spur the city was built on. The walls were repaired and modified but never extended in reach after that: later expansion needs were managed through suburban development outside the city walls. This phase of expansion is the one where Greek rational town planning was superimposed to the existing settlement and topographical situation. It implied a modification and adjustment rather than any radical redesign of what was already there: Hence the older settlement being rather more organic in shape and approach than the newer part. A similar approach was followed with the city gates and roads leading in the various directions: to Naples / Herculaneum, Vesuvius (rural farms), Capua, Nola, the river (Sarno Gate), Nuceria, Stabiae and of course, the sea and harbor which at the time was much closer than it is today to the site. The Volcanic explosion of 79AD alone extended the coast away from the city by some 500metres. 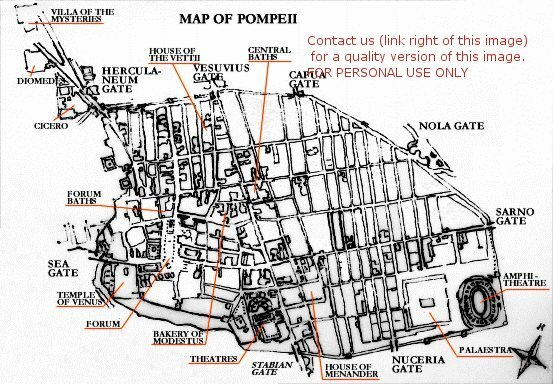 Unlike other Roman cities which survived longer periods, Pompeii displays a varied array of construction materials and structures peppered across an otherwise very regular grid-like street plan such as Tufa stone from Nucera and Sandstone from the Sarno river deposits. Walls in various building styles are composed of mixtures of volcanic materials and this variety, so particular of Pompeii, gives archaeologists many indications regarding the city’s construction history from the 6th century BC through to the city’s end in the 1st century BC. the far south-eastern corner, reserved for the amphitheatre and roman Palaestra isolated from one another by way of a large open public square and roads. These three open areas lay at an eccentric angle to the rest of the city grid and naturally provided a focus for public service buildings. Compare and Contrast Pompeii with modern society.